Thank you. One of our staff will respond shortly. Located on the Bangkok side of the Chao Praya River, our hotel is at the base of Krung Thon Bridge in historic Dusit district. 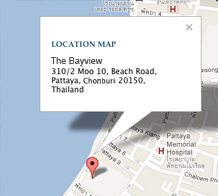 We’re only a 45-minute drive from Suvarnabhumi International Airport and 20 from downtown Bangkok. Hop aboard our private ferry to reach the city-wide BTS Skytrain at Spahan Taksin station in just 25 minutes. 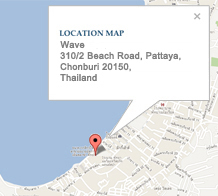 We’re conveniently located in downtown Bangkok, opposite the Airport Rail Link and BTS Skytrain Phaya Thai stations. 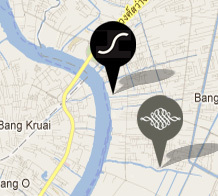 We make it easy for you to get around the city and to/from Suvarnabhumi International Airport (25 minutes). We are only a short walk or ride away from all the best shopping, sightseeing and dining that Bangkok has to offer. 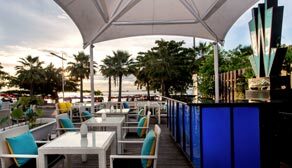 Our resort has one of the best locations in town — just meters from the beach and beside bustling Walking Street and nearby Bali-Hai Pier on the southern tip of Pattaya Bay. A plethora of water sports, shopping, restaurants and bars, amusements parks, golf courses, tourist sights and more are within easy reach of the hotel via public and private transport. The central downtown location of our hotel in the middle of world-famous Beach Road lets guests easily explore the wonders of this lively seaside city that never sleeps. Best of all, we’re located beside Asia’s largest beachfront shopping complex — Central Festival, housing over 500 shops and restaurants, plus a bowling alley, supermarket, cinema, arcade, etc. 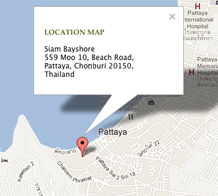 We’re conveniently located in the absolute middle of Pattaya’s thriving dining, shopping and entertainment scene on bustling Beach Road. We face the beach and are well-placed to provide guests with the best in both urban living and beachside relaxing. Next door is located Asia’s largest and best beachfront shopping complex, Central Festival. If you wish to travel in style, book a limousine from our fleet of cars that are on standby 24 hours a day in Bangkok and Pattaya. 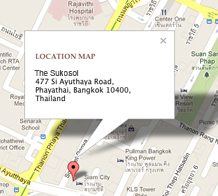 Simply contact us via e-mail reservations@sukosolhotels.com or phone +66 (0) 2247 0123 to make your booking in advance. Or speak to our friendly Concierge in the hotel lobby. Rates quoted are based on your length of stay and either single or double occupancy. All rates are quoted in Thai Baht and subject to 10% service charge and 7% government tax. 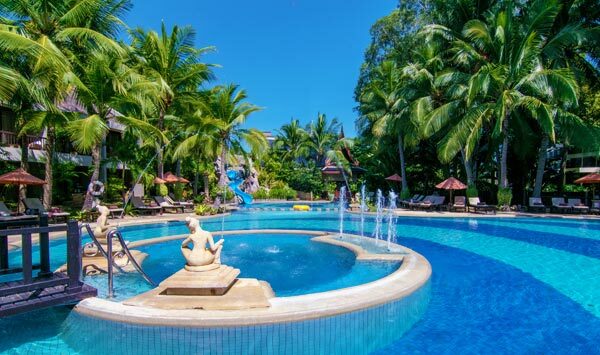 A cash deposit of Baht 1,000 nett per night or a valid credit card as security is required upon check-in to cover incidentals, in addition to full payment of room and tax (if not already paid in advance). To register for a room, guest must be at least 18 years of age. Check-in time is from 14:00 onwards and check-out time is before 12:00. A valid government-issued identification card or passport is required at check-in. Should you arrive to the hotel early, kindly refer to our Guest Services Team and they will be happy to hold your luggage until check-in is possible (in some cases early check-in is available, but we cannot guarantee this). Late check-out is subject to room availability and occupancy. We advise that you check with our Front Desk at least 24 hours prior to departure. Late check-out will incur a 50% room charge for checking-out between 12:00 to 18:00, and a full-day room charge after 18:00. A valid credit card is required for all reservations to secure your reservation. We accept Visa, MasterCard, American Express, Diners and JCB cards. Debit cards are not accepted. Exchange rates are applicable at time of reservation, but are subject to currency fluctuations. Billing will be at the prevailing exchange rate at time of check-out. The cancellation or amendment of a “Best Available Rate” reservation must be made 24 hours in advance (by 16:00 local time) of your scheduled arrival time. For “Packages” and “Special Offers”, specific Terms & Conditions are applicable (please check your Booking Confirmation for full details). Cancellation or amendment made within 24 hours of arrival will incur a cancellation fee of one night's room charge and tax. In the event you do not show-up, reservations will incur a charge of one night's room charge and tax, which will be deducted from the credit card used at time of booking. Stay for a minimum of two nights in any room type during the week (Sun-Thu) and save even more on our cheapest available rates. Stay for a minimum of two nights during the week (Sun-Thu) and save even more on our cheapest available rates. Enjoy a weekend in Bangkok with our special Weekend Getaway package including complimentary breakfast and late check-out this summer.